This article is meant to provide you with details in configuring Due Date rules for Activity Types and Report Types. If you have a question not addressed here, you can search at the bottom of this article in Related Topics or you can Contact Support. Due Dates are dates on which an event should occur or when a document should be submitted without being considered “Late” or “Missed”. If you have an Expiration Date for an Activity Type or Report Type, you cannot have a Due Date as well. Period – This is the amount of time until something is due and at what frequency (i.e. monthly/every 90 days/repeating). Basis – This is the event or occurrence from which the due date is calculated (i.e. after Admission, Home Visit, Discharge, etc.). You must be an Agency Administrator to access the “Administration” menu on the left side of your Workspace. From an Activity Type or Report Type, click on the General tab. Triggers are found within the “Activity or Report Type Information”. For more details on Activity Types or Report Types as they pertain specifically to Programs, please see Related Topics. 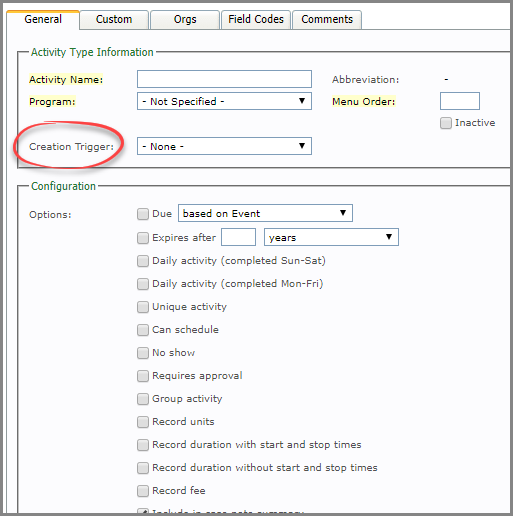 Create Trigger(s): If you would like an activity type or report type to be triggered based on the occurrence of an event, you can select one of these Program Triggers. Should you check a box, the eR system will often adjust your subsequent check-box options. Options: Should you check a box, the eR system will often adjust your subsequent check-box options. For more details on all Options within Activity Types or Report Types as they pertain specifically to Programs, please see Related Topics. Select the amount of days that the activity will be due in then check the box underneath it, “Repeat due date ever x days after previous x”. Enter in the amount of days the activity will be due again and base it on the previous Due Date or previous Activity Date. Delete if due after close date and case closed. Use months instead of days for due date units. As always, be sure to SAVE your work.